They like to do things big in Dubai, including a newly-approved concentrated solar power project that will generate 1,000 megawatts of power by 2020—and a whopping 5,000 megawatts by 2030. The Dubai Water and Electricity Authority (DEWA) has announced the launch of the world’s largest concentrated solar power (CSP) project. Located on a single site within the Mohammed Bin Rashid Al Maktoum Solar Park, the plant will consist of five facilities. The first phase of the project is expected to be completed either in late 2020 or 2021, at which time it’s expected to generate 1,000 MW of power. By 2030, this plant could be churning out five times that amount—enough to raise the emirate’s total power output by 25 percent. 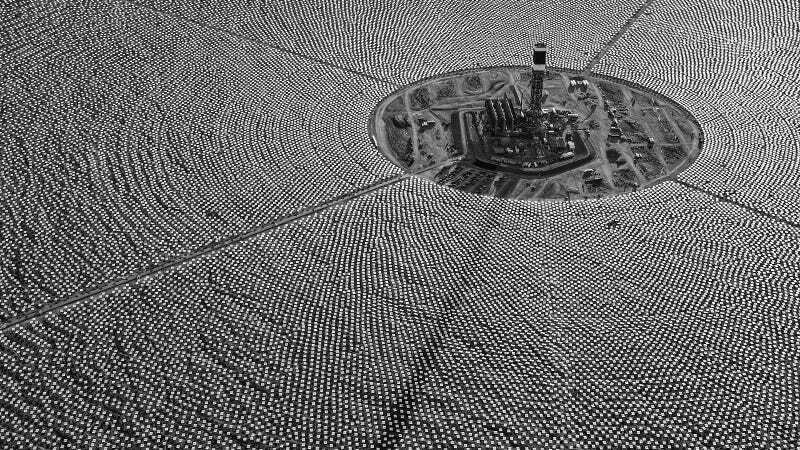 By comparison the Ivanpah CSP in California (which is currently the world’s largest) generates about 392 MW of power. Morocco’s Ouarzazate solar power plant will provide about 580 MW of power once it’s complete in 2020. Concentrated solar power plants, unlike solar energy drawn from photovoltaic cells, use a large array of mirrors (called heliostats) to concentrate a large area of sunlight onto a small area, typically on top of a tower. Electricity is generated when the concentrated light gets converted to heat, which drives a steam turbine connected to an electrical power generator. An advantage of CSP is that thermal heat can be stored easily, making it possible to produce electricity after sunset. The Dubai plant will have several thousand heliostats located around a tower. The resulting heat-transfer fluid will power a steam turbine to generate electricity. Incredibly, the new plant will deliver power at less than 8 cents per kilowatt-hour, down from the typical 15 kilowatt-hour rate. Once complete, the solar park is expected to reduce 6.5 million tons of carbon emissions each year. A typical coal plant produces around 3.5 million tons of CO2 per year. The new plant is part of Dubai’s Clean Energy Strategy 2050, which will see the emirate generate seven percent of its total power from clean energy by 2020, followed by 25 percent in 2030, and 75 percent by 2050.